Mageplaza Quick View for Magento 2 is a mixture extension which not only helps customers to quickly view product information but also adds preferred items to carts without leaving the current page. This is the very time-saving and user-friendly solution to online stores, which improves the shopping experience and enhance conversion rates. Problem 1: Customers would like to make the comparison between many products quickly right on Product Listing Page or Home Page. Hence, they wish to take a glance at several products to know the main features before focusing more on specific items. Problem 2: Customers would like to add items to cart but not be navigated to another page instantly while they are eager to shop more. Problem 4: It costs time to load new pages (Product Detail Page, View Cart Page) on Magento Default, which makes customers feel inconvenient and impatient. Problem 5: The current interface of these functions on Default Magento is quite simple and unattractive. Solution 2: A Product Detail Popup is needed to help customers quickly preview product details while still keep them on the current page. Solution 3: An Add-to-Cart Popup should be added to help customers quickly add items to their cart without being navigated and they can continue shopping. The first noticeable feature of this helpful extension is the quick-preview function.With the support of Quick View popup, customers can preview shortly the details of their concerned products quickly right on the Product Listing Page, Home Page, Checkout Cart Page easily. Customers can take a glance at several items to know the main features before they decide to click an item to view more details or pick it to their carts. Also, Add to Cart pop-up supports allows adding items quickly to cart then reviewing the updated cart easily on only one page. 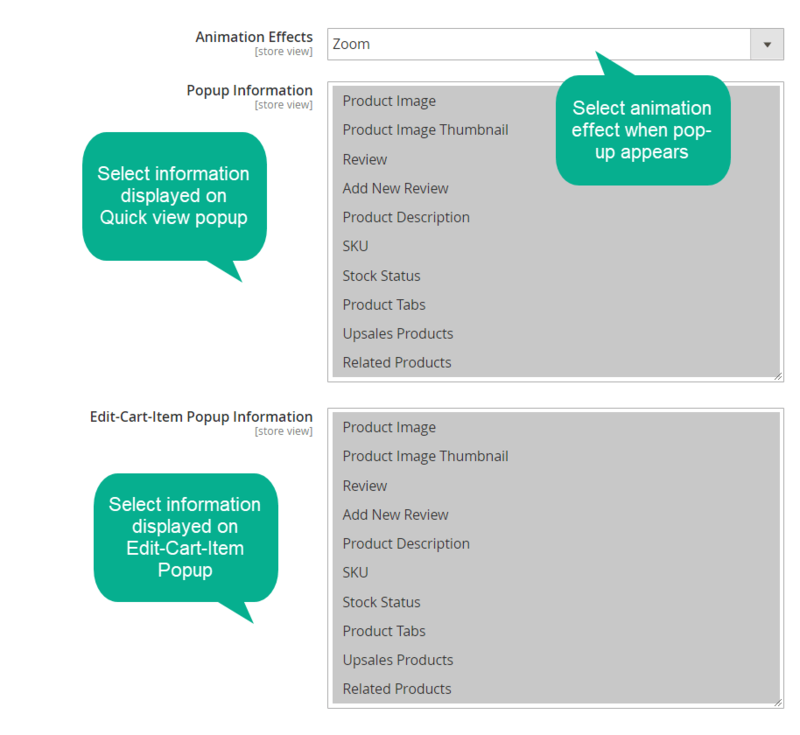 Besides, Quick view popup also can be applied on cross-selling or up-selling items on Product Detail Page. Customers can glance quickly related products, then feel interested and make the next purchase. Stop being navigated to a new page unexpectedly when you are willing to continue your shopping! Ajax Cart is the proper solution with the application of Ajax technology. The item-flying effect notifies customers that your favored products have been added shortly to Mini Cart. Then, a pop-up simultaneously appears and allow customers to decide whether they would like to continue shopping or not. Besides, Ajax is also applied on actions “Add to Compare” and “Add to Wishlist” on the Quick view popup. With this feature, customers no longer have to be directed new page unexpectedly while they still want to go shopping more. Again, this helpful feature also contributes to improving customer experience and support to boost sales in e-commerce stores. Not only can customers add products to their cart right on the current page quickly but they also customize their beloved items conveniently via a popup. The main attributes of products such as color, size, and quantity can be easily and quickly selected via both Quick View and Add to Cart popups. Customers can freely select attributes upon their wish, turn off the pop-up and continue shopping with ease while not any going-back actions are required. Besides, Quick View pop-up also helps to update item parameters quickly on Shopping Cart Page. Also, customers can add their favorite items to wishlist or compare easily via this small window. As a result, picking the right items to carts is now much more convenient and time-saving for customers than ever! 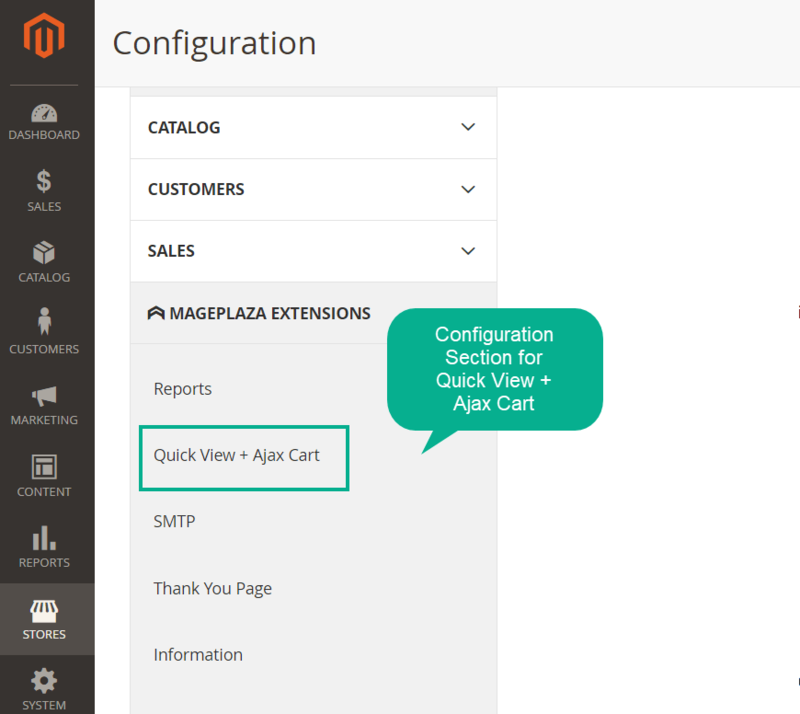 Easy and free pop-up customization is one more key feature of Mageplaza Quick View - Ajax Cart extension. The module allows customizing contents easily. 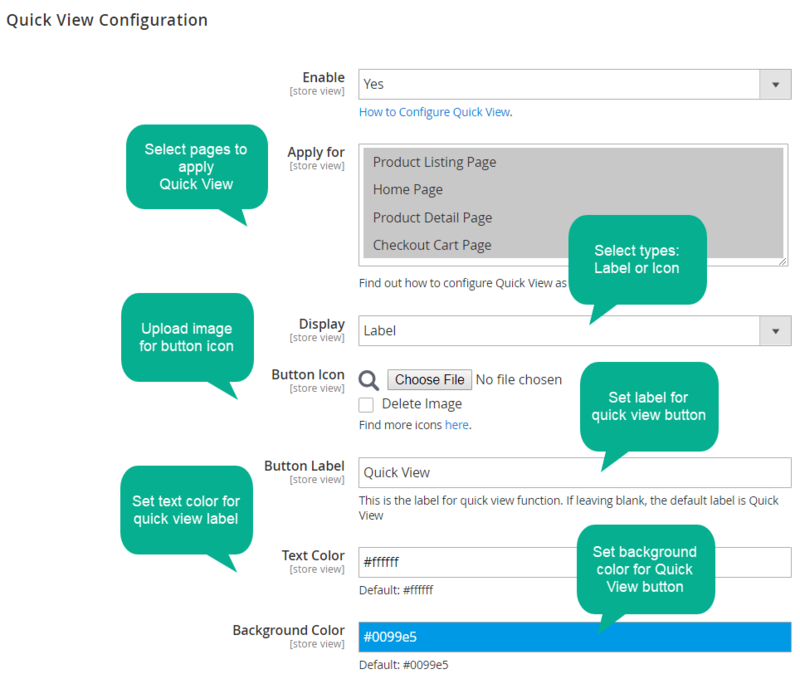 With Quick View pop-up, admins can set button label and select display information such as Product Image, SKU, Product Description, Stock Status and more. 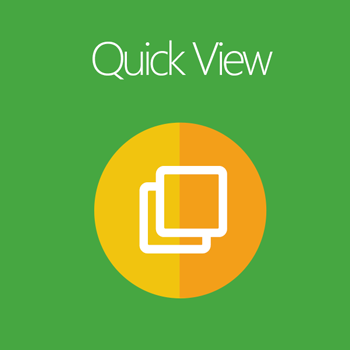 Quick View button can be configured as a widget to place anywhere. Allow customers to leave their reviews and/or rating quickly via the popup. Set time to display Add to Cart popup after being clicked on. Quick View and Ajax Cart are well responsive with mobiles, desktop, tablets, and other screen sizes. Set time restriction to display Add to Cart popup after being clicked on. Create Quick View widget and embed at any place on site. filter_drama Is this extension with two functions? 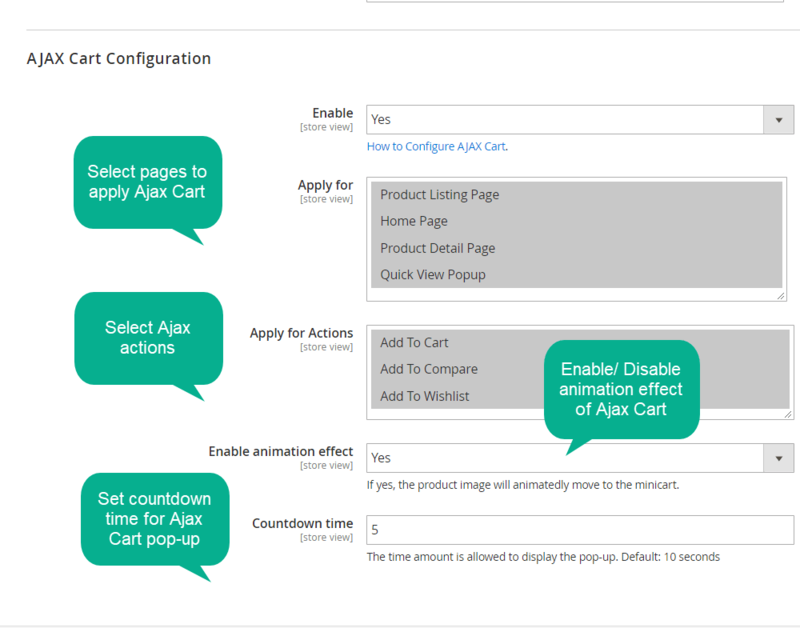 Yes, Quick View + Ajax Cart is the mixture extension which allows you not also quickly preview product information but also add any product to cart without leaving the current page. filter_drama Can I design Quick View button? Yes, definitely. From the admin backend, you can use label or upload icon for Quick View. Then, you can select text color, background color. filter_drama I would like Quick View appear lively. How can I do? You should add more animation effects. The extension offers various effects: zoom, newspaper, horizontal move, move from top, 3d unfold, zoom out. filter_drama What is Ajax Cart? When you click Add to Cart, Ajax Cart allows a pop-up to appear. Then you can pick quickly product to add to cart , add to wish list or add to compare list without being redirected to other page. When you turn off the pop-up, you can continue your shopping on current page. filter_drama Can I select product attributes on Quick View popup? filter_drama When I edit cart on Shopping Cart page, is there any pop-up to quick edit? Yes, the pop-up is also supported to edit selected items on Shopping Cart page, so you will not be redirected to the Product Page. Just quickly edit and quickly checkout.